28 people maximum - on a full size 53 seater luxury coach, so everyone can stretch out, relax and enjoy the view. Our popular Emerald Isle Discovery Tour makes a return...this time, going backwards! Starting in Dublin (east) and finishing in Galway (west). It’s our East to West and Northern Tour! Prepare to spend 10 full days and nights adventuring through the north of Ireland (the Republic and Northern Ireland) and western Ireland, including my home county of Donegal (arguably the most beautiful county, though I may be just a tad bit biased). We start out arriving at Dublin airport, tracing a path North and West and then South, We will be travelling from Dublin to Belfast and Derry in “The North” (Northern Ireland, U.K.) back into the Republic through Donegal then Westport and finally to Galway. Returning from Shannon airport back to the USA. Three to five weeks or so before our departure date, for those who can make it, we'll meet up at a local pub in Ann Arbor, Michigan, to enjoy some dinner together, get to meet our fellow travelers, go over the itinerary, and answer any questions. If you fly out of Detroit (DTW) with me, we will meet at the airport and board together for the short flight to New York JFK. If you're joining us from another city, we'll all come together at JFK airport in New York as we continue on our transatlantic, overnight flight to Dublin airport (DUB) which includes an evening meal and breakfast on board. Some guests may be meeting us at Dublin airport as their flights took a different route to Ireland. After our overnight flight, we're going to take things slow so we can all unwind and relax. Our experienced driver-guide, Gary Tierney, will meet us at the airport, ready to lead us on a driving tour to some charming villages located along Dublin Bay just north of the city. Gary's been leading tours for nearly 30 years; he's taken hundreds of tours in that time including those for Rick Steves who many of you will know from his PBS shows. I can honestly say there's no one else I would trust more to take us around Dublin and Ireland. Also, we'll also be traveling in a full-size luxury motor coach so there's plenty of room to stretch out, get comfy, and take in the views out of the huge windows (we only take 28 people max, so the bus is barely half full at most!). First up is the charming seaside village of Malahide, where medieval meets modernity. The 12th century Malahide Castle, with its secret gardens, blends perfectly among the boutiques, cafes, and shops in the village. We'll grab a bite to eat in the fishing village of Howth (say it like a local “Hōthe”) and take a nice afternoon stroll. Stellar ocean views of the Irish sea, the Baily lighthouse, Ireland’s Eye (island and bird sanctuary) and all kinds of little shops offer a great start to our trip. After our coastal visits, relaxed and bellies full, Gary will give us a short, narrated tour of Dublin City. Pointing out some highlights and helping us get our bearings, this is a great way to get some ideas for tomorrow's adventures in Ireland’s capital city. 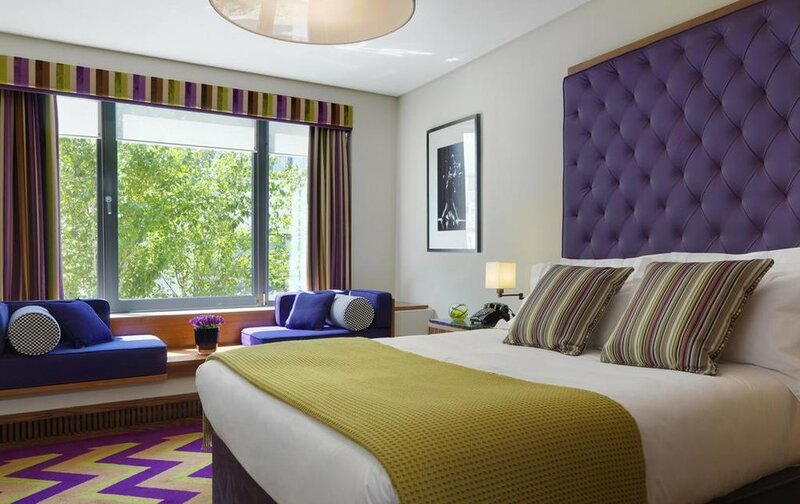 Located in the heart of Dublin on St. Stephen’s Green just steps from famous Grafton Street, we'll check into The 5 star Fitzwilliam Hotel for a quick freshen up before an early dinner at a local restaurant. Learn more about: Malahide, Howth, Dublin, The Fitzwilliam. Explore every nook and cranny of Dublin on your own today with a Hop On, Hop Off bus tour pass (complimentary). Your pass allows you to travel freely all over the city and stop at all the main attractions, shopping areas, museums, and points of interest: the Guinness Storehouse and Jameson’s Distillery, Trinity College (Book of Kells), the National Museum of Ireland, St. Patrick’s and Christ Church Cathedrals, Grafton Street (shopping)...there's no shortage of things to see and discover! Sound overwhelming? No worries, I'm very familiar with the city and can help you plan your day's activities around whatever you're most interested in. Dinner is open for you to try a cozy little hole-in-the-wall, a 5-star restaurant, or whatever suits your taste in-between. 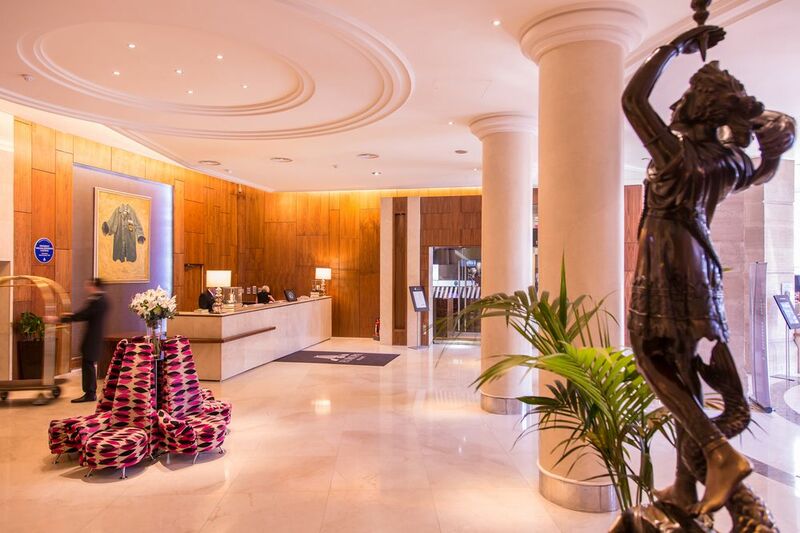 We'll spend a second night at The 5 star Fitzwilliam Hotel, within easy walking distance of all Dublin has to offer. Learn more about: Hop On, Hop Off bus tour, Dublin, The Fitzwilliam Hotel. After a famous full Irish breakfast in Dublin, we’ll head off north to Belfast City, crossing the border into Northern Ireland and the U.K. Our destination will be the Titanic Belfast Experience, where you can explore the ill-fated ocean liner's construction shipyard, walk the decks, travel to the depths of the ocean and uncover the legend of Titanic, because this is where it all began. With 9 galleries and multiple dimensions to the exhibition which draw together special effects, rides, full-scale reconstructions and innovative interactive features, you will explore the Titanic story in a fresh and insightful way. You’ll experience why this museum experience is #1 year after year. We'll enjoy our first night at the The Europa Hotel, Belfast, in the heart of this vibrant northern city. We will have dinner together tonight at a local restaurant a short distance from our hotel. Once shunned by travelers unnerved by tales of the “Troubles” and sectarian violence, in recent years Belfast has pulled off a remarkable transformation from bombs-and-bullets pariah to a hip-hotels-and-trendy-restaurants town. To lay the groundwork of Belfast’s recent history, we'll start the day with a guided tour of the city's Catholic and Protestant neighborhoods with the famous black taxi tours. Our local guides, one each from the Catholic and Protestant perspective, will explain the history and daily life of this divided city. Highlights include the artsy political murals of the Falls and the Shankill that graphically tell the story of the Troubles. We'll see the Peace Line, a towering wall up to 25 ft high that separates neighborhoods. Some have gates in them (sometimes staffed by police) that allow passage during daylight but are closed at night. The wall keeps Nationalists and Loyalists apart and in the process, divides the communities but helps to keep the peace. After our driving tour (with lots of stops) we will be dropped back at our hotel where you will have the rest of the day free to explore this lively, vibrant city. Perhaps you may want to take a drink at the famous Victorian watering hole, the Crown Liquor Saloon? It’s like stepping back in time with its carved-mahogany booths, etched-glass, and gas lamps. Tonight will be our second night at The Europa Hotel, Belfast. Learn more about: Black Cab Tours, The Europa Hotel. Derry, also known as Londonderry, is a city on the River Foyle in Northern Ireland, U.K. It’s known for its intact, well-preserved 17th century city walls that we will walk upon. 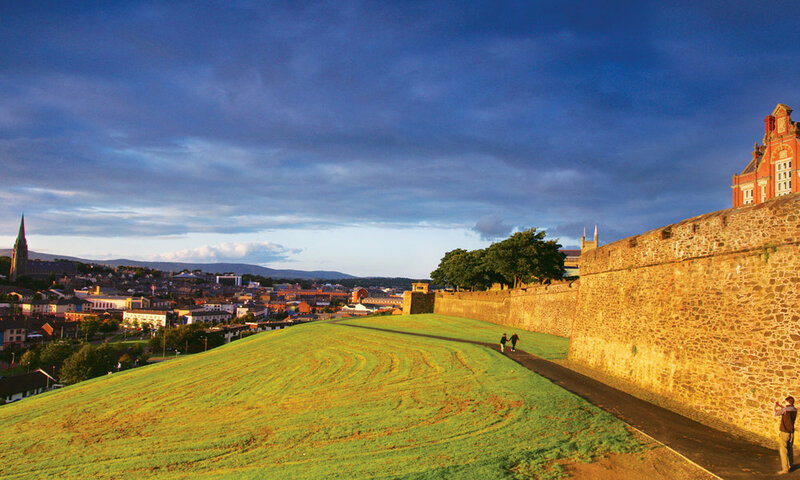 With a local expert guide as we walk the city walls, we'll learn the history of the city, including the 17th century Siege of Derry and the more recent history of the Troubles such as 1972's Bloody Sunday (the Bogside Massacre) and the Irish civil rights movement. Near the Peace Bridge, the Tower Museum has city views and historical exhibits, while huge and lovely stained-glass windows adorn the pretty-as-a-picture neo-gothic Guildhall. Giant’s Causeway, renowned for its polygonal basalt columns, is the only UNESCO World Heritage Site in Northern Ireland. Resulting from a volcanic eruption 60 million years ago, the Giant's Causeway has attracted visitors for centuries because of the unique polygonal columns of basalt in perfect horizontal sections, where land meets sea. The vast expanse of regular, closely packed, volcanic stone columns looks for all the world like the handiwork of giants, hence the name. We'll learn the legend of Irish giant Finn MacCool and the legend of how he created the causeway. 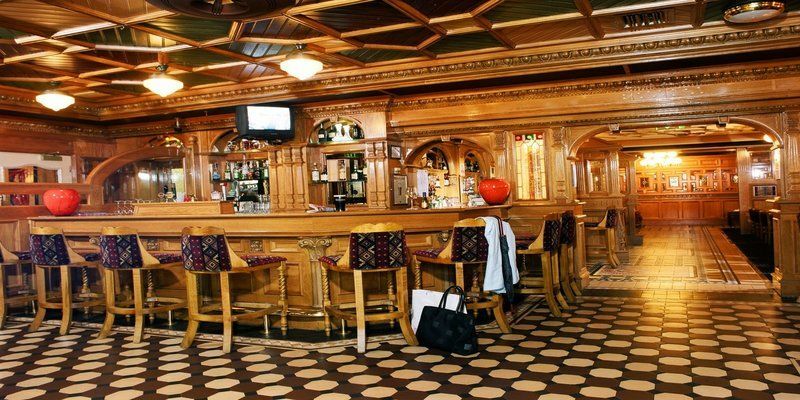 Our next 3 nights will be at the award-winning Harvey’s Point Hotel, which is situated on the serene shores of Lough Eske, just outside of Donegal Town in the Irish Republic. We will dine together tonight in the restaurant overlooking Lough Eske, voted Best Hotel Restaurant in Ulster by the Irish Restaurant Association. Slieve League, or Sliabh Liag in Irish-Gaelic, is Ireland’s ultimate sea cliff experience and a signature point on the Wild Atlantic Way route. Located in the Gaeltacht (Irish-speaking) region of County Donegal, Sliabh Liag cliffs are the highest accessible sea cliffs in Europe, rising nearly 2,000 feet above the swirling Atlantic ocean below. 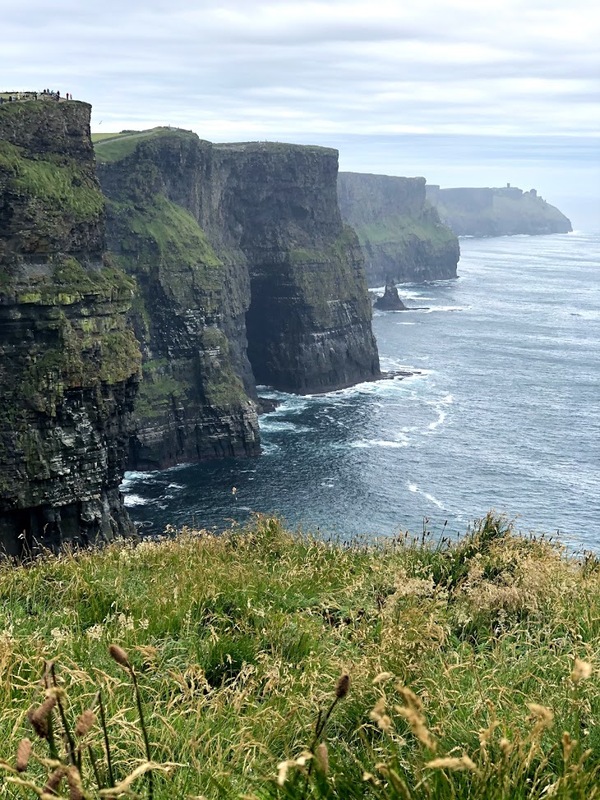 The Cliffs of Moher get more publicity and more visitors, but these spectacular cliffs are higher, and very special in their own right. Looking down at the ceaselessly churning sea, you'll see two rocks nicknamed the 'giant's desk and chair' for reasons that are immediately obvious. After exploring the Sliabh Liag sea cliffs, we'll make our way to Letterkenny, also in County Donegal, for the night. Along the way we will stop in the little village of Ardara. This part of the country is the traditional capital of Ireland’s wool industry and weaving. We'll visit a master handweaver's workshop where we’ll see the weaver at work, and if we’re lucky, maybe even have time to stop and wet our whistles at Nancy's bar as well. Our second night at Harvey’s Point Hotel, named the #1 hotel in Ireland, and dinner at a local restaurant. Learn more about: Sliabh Liag, Ardara. Today we'll head into Glenveagh National Park, Ireland's most northerly national park situated in the rugged Derryveagh mountain range, a place of stunning natural beauty. Glenveagh National Park is a remote and hauntingly beautiful wilderness of rugged mountains, pristine lakes, tumbling waterfalls and enchanted native oak woodland in the heart of the Derryveagh Mountains in the northwest of County Donegal. At the center of the park on the shores of Lough Veagh is Glenveagh Castle, a 19th century castellated mansion, built as a hunting lodge. Although beautifully situated, the story of the surrounding land being cleared of the peasantry for the development of this property is sad indeed. The Castle Gardens are regarded as one of Ireland’s outstanding horticultural masterpieces. The lands around Glenveagh are home to wild deer and golden eagles. After our visit to Glenveagh we'll take a scenic drive along the by-roads of Donegal passing through charming villages and taking in stunning vistas as we make our way back again to Lough Eske Castle. Dinner will be on your own tonight, maybe at one of the great little pubs in Donegal Town which is just a short taxi ride away. This will be our third night (and unfortunately) our last night at Harvey’s Point Hotel. It will be hard to leave. 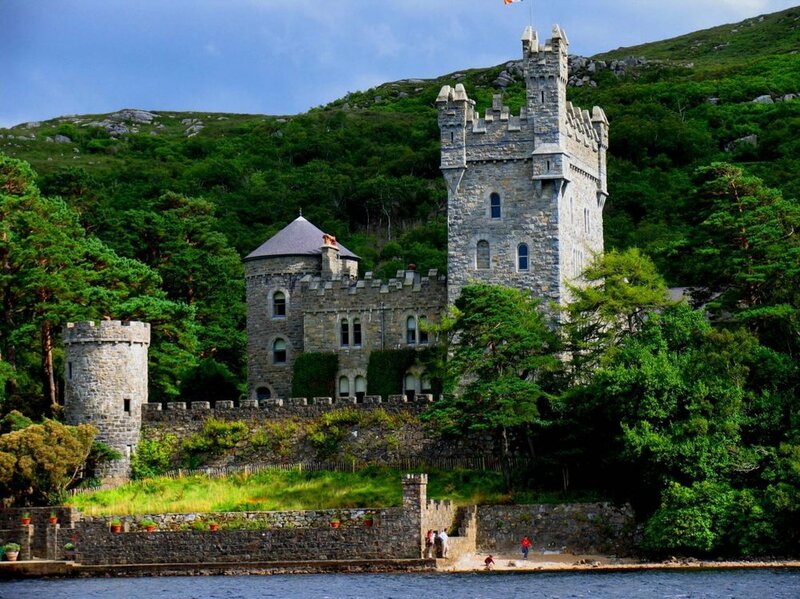 Learn more about: Glenveagh National Park and Castle. Kylemore Castle was built in the late 1800s by Mitchell Henry MP, a wealthy businessman and liberal politician. Inspired by his love for his wife Margaret, and his hopes for his beloved Ireland, Henry created an estate boasting ‘all the innovations of the modern age’. An enlightened landlord and vocal advocate of the Irish people, Henry poured his life’s energy into creating an estate that would showcase what could be achieved in the remote wilds of Connemara, with its beautiful castle-like manor house and gorgeous formal Victorian gardens. Today Kylemore Abbey is owned and run by the Benedictine community of nuns who have been in residence here since 1920 (forced to depart Belgium in WW I), and recently Kylemore began a summer academic program with the University of Notre Dame. Tonight is the first of 3 nights at The Park House Hotel Galway in the city center, just steps from the lively musical pubs and delicious restaurants. We’ll eat dinner together tonight at a local multi-award winning gastropub. Learn more about: Kylemore Abbey and Victorian Walled Garden, The Park House Hotel. This morning we head off, by ferry, for a day long Island adventure to the largest of the Aran Islands, Inis Mor, which literally means ‘big Island’. With prehistoric Christian forts and friendly locals, it’s easy to see why this is the most popular of the Aran Islands. 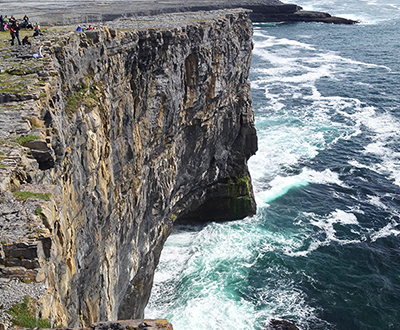 We’ll explore the Island and of course we’ll visit the famous cliff top fort known as Dun Aenghus. After our galavant around the Island, we’ll board the ferry and head back to Galway. Our second night in Galway City at the centrally located Park House Hotel. Dinner on your own tonight in Galway, with so many choices from fish and chips to upscale fine dining. Learn more about: Inis Mor, Dun Aonghasa. Today, after a good night's sleep and a hearty Irish breakfast, you'll be keen to explore all that Galway has to offer. Quay Street has lots of shops, cafes, pubs and restaurants that you can spend some, or all, of your time in. There's Galway Cathedral (officially Our Lady Assumed into Heaven and St/ Nicholas) with its striking interior of green Connemara Marble. Other places of interest include: Lynch's Castle, a medieval town house, now a branch of Allied Irish Bank; the Church of Ireland’s St. Nicholas Collegiate Church, the largest medieval church still in everyday use in Ireland, and the only Anglican church in Galway; the National University of Ireland, one of the 3 colleges of the Queen's University of Ireland (along with Queen's University Belfast and University College Cork); the Lynch Window on Market Street where, in 1493 the Mayor, James Lynch FitzStephen, hanged his own son for the murder of a young Spanish visitor who was too friendly with the girlfriend of the Mayor's son; the 13th cent. Hall of the Red Earl, the earliest surviving medieval settlement fragment (off Flood St.) can be viewed through a protective glass wall. Finally, the Galway City Museum near Spanish Arch features the history and heritage of Galway and a collection of the most important Irish artists from the second half of the 20th century. This is our last night at The Park House Hotel and our last night (for this tour) in Ireland. We’ll have a farewell dinner together tonight. Learn more about: Galway City, Galway Cathedral, Hop on Hop off Bus Tours. After a final ‘full Irish’ breakfast we will head to small, easy to navigate, Shannon Airport (SNN) as we begin our journey home to the U.S. Until next time!